Avalanche is an all new competitive viddoe challenge for 1 or 2 players. Play action is innovative and exciting, designet to keep players come back again and again to achieve higher individual scores or to win against an opponent. 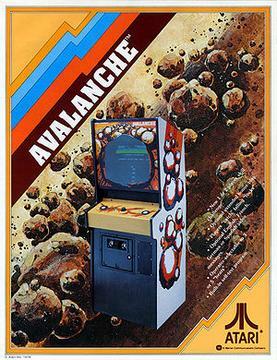 The object of the game is to "catch" avalanching "rocks" with a controllable set of "paddles" that diminish in number and size as the rocks fall faster and faster. When a rock falls through to the bottom line, the heat is over. If all the rocks are caught, another set appears, but the player starts with less paddles. Realistic sound effects and color stripes on the monitor add to the escitement and attraction appeal. And players can play Avalanche indefinitely — as long as they don't miss!